Horror films don’t have to make sense; in fact, it’s better if they don’t. 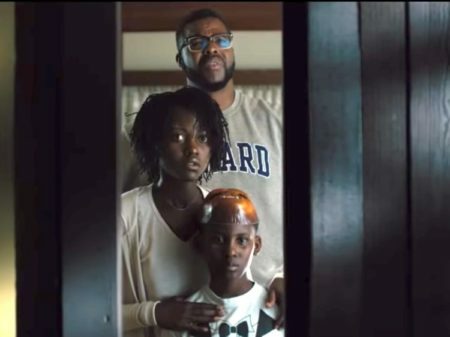 Writer-directorJordan Peele’s ‘Get Out’ was at its best while it was making everyone uncomfortable about racism and did so in an unexpected way, by making the white liberals appear to be trying hard to say the right thing. Those awkward exchanges were very subtly funny in a way that comedy-horror films can never manage to be. 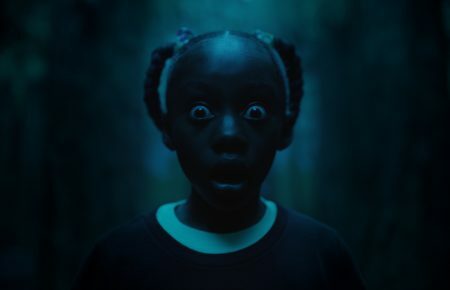 With that success under his belt, Peele has gone large and used the black experience in America as the basis of a warped parable with its roots in folk-horror. Doppelgängers go back to Euripides, and usually represent warnings. They are ghostly harbingers of death and rarely have voices of their own. Here, Peele gives them a voice. The opening gives us echoes of ‘Jaws’ and Stephen King as a little girl gets lost on a beach and enters a sinister funhouse to find herself confronted (in a delicious rendering of a Magritte painting) by herself. Years later Adelaide (Lupita Nyong’o) returns there with her family and faces off against a complete mirror-image family who want what they have. The film’s centre section is a home-invasion caper with some unexpected laughs, especially from Gabe, the husband, who attempts to call the police through an Alexa-type device with disastrous results. What’s so refreshing here is to see a relaxed, affluent black family who reflect the white screen equivalent (the twin motif again). It makes you realise how many Hollywood films use black characters simply to be killed off or arrested. They’re certainly more together than their white friends, Elizabeth Moss and husband, who are also subjected to a doppelgänger confrontation. This is the point at which Peele would have had to decide; do I keep this one family’s nightmare or go for broke and involve others? Happily, he includes the whole of America because ‘they’ are ‘us’ and exist right across the country. It does feel an excessively American issue because of the nation’s history and the ongoing miscarriages of justice that still surface in its media. That’s a lot of baggage but the film wears it lightly, being fun, scary and thoughtful in equal measure, right up until the same mis-step Peele made in ‘Get Out’. He attempts to explain his way out of a corner. In ‘Get Out’ it took the form of a ridiculous info-dump that tried to justify all that had gone before with convoluted reasoning. Here, ‘Us’ is stuck with a monologue that tries to do the same thing. Simply excising both scenes would have strengthened the films. This is all too often the curse of horror; ‘Hereditary’ fell into the same trap, and recently only world horror movies like ‘Atrapados’ have avoided it. It’s like having a narrator step in at the end of ‘The Shining’ and rationalising the hallucinatory visions (‘The Shining’ is repeatedly referenced in the film). Horror should not be rationalised away. Despite this, Peele just about pulls it off by making the meaning of his parable clear, although it’s a pretty messy process that leaves lots of dangling threads. He wins out because he knows how to tell a good story and makes his characters rounded and believable, in both normal and doppelgänger forms. It would be a shame if he was forced into being ‘the black experience horror director’ when he’s just a good director per se, and hopefully has many more stories to tell.